Adblock plus is a one of the best plugin to get rid of annoying advertisements available for Chrome, Firefox, Safari and other browsers, it effectively blocks almost all the ads including banner ads, inline ads, popups and video ads etc. and helps to protect your PC from malware and other harmful viruses. But Adblock Plus also truncates the revenue of the blog. Here we have listed out some WordPress plugins to get rid of the Adblock Plus browser extension. The WordPress plugins listed below notifies your website visitors to whitelist your website. Simple Adblock Notice plugin by TechSini detects adblock plus extension from any major browser and shows a popup message to white-list your website to display the ads. This is a very simple plugin, just install and activate it, that’s it. Check out the Simple Adblock Notice plugin’s development page for more information or download the Simple Adblock Notice here. Adblock Notify by b*web displays a predefined popup message to the visitor if it finds Adblock extension in the browser, this plugin can detect the ad blocking plugins for all the major browsers, Adblock Notify also displays the notify stats in your WordPress dashboard. Download adblock notify. Ad Blocking Detector detects not only Adblock Plus extension but also detects other ad blocking plugins and displays the message set by you to the visitor to whitelist the website. Check out Ad blocking detector plugin. 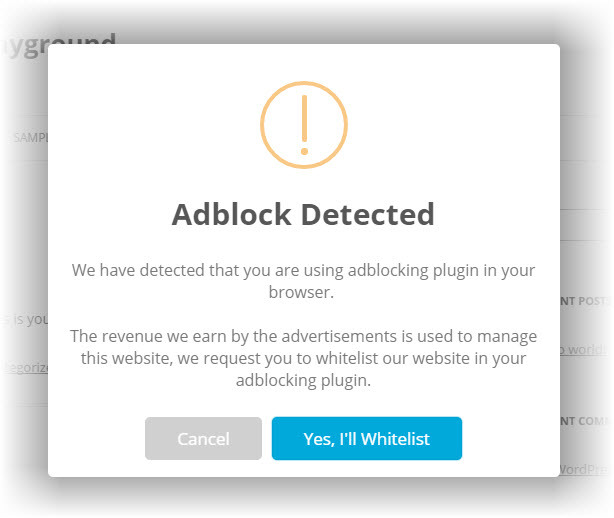 Anti-block WordPress plugin shows a notice to whitelist your website in ad blocking plugin. The notice comes with 2 buttons, this plugin won’t annoy the visitor again for his session if the visitor clicks on the cancel button. Download Anti-block WordPress plugin.